Ladies and Gentlemen, meet Mercedes Benz‘s new born baby, The 2017 E Class. After many teasers, many spyshots, and news here and there on the Internet, Mercedes presented finally the newest E Class, and it the most sophisticated, the most intelligent, and I am not sure on the most beautiful. As always, Mercedes put each of its new models on the throne of its class. Let’s talk engines first. The presented models, were both the E200 and the E220, presenting the all new Mercedes 4-cylinder engine. The E 200 4-cylinder produces up to 184 bhp and 300 Nm of torque, while the more efficient, more powerful diesel E 220 4 cylinder, produces up to 195 bhp and 400 Nm of torque. It has a staggering fuel consumption value of 3.9 L to the 100 km. The new 4-cylinder engines are more compact, smaller, with less space per cylinder. Still, it powerful, in both diesel and petrol engine, and efficient in both fuel consumption and CO2 emissions. Levels go up to 102 g per km, which is fascinating. Another new engine has been presented, and was fitted on the 350 e. It is a 2.0 Liter cylinder, coupled with an electric engine, and producing both up to 286 bhp and 550 Nm in torque. 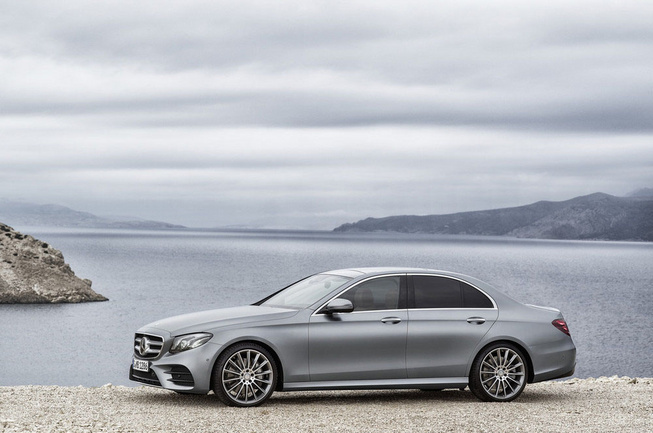 There are two 6-cylinder engines, one fitted on the E300 variant and the most powerful is for the E 400 4 matic. This engine can produce up to 333 bhp and a torque of 480 Nm, but this variant will be sold in Europe only. Of course, let us not forget the mighty AMG variants, The E63 AMG will be having a reworked version of the 4.0L engine fitted to the AMG GT, and C63 AMG, but it will produce around 600 bhp. All that thanks to reworks on the engine material, the turbos, the camshafts… All of these engines are equipped with a 9-gears tronic automatic transmission, as a standard feature. The new feature will be having a Speecshift AMG pack instead of the usual torque converter for all the models. As many of you noticed, the 2017 E Class, has a restructured face, new headlights, longer wheelbase, and a rear inspired from the S Class. These new “lines” give a direct idea to Mercedes new design philosophy. 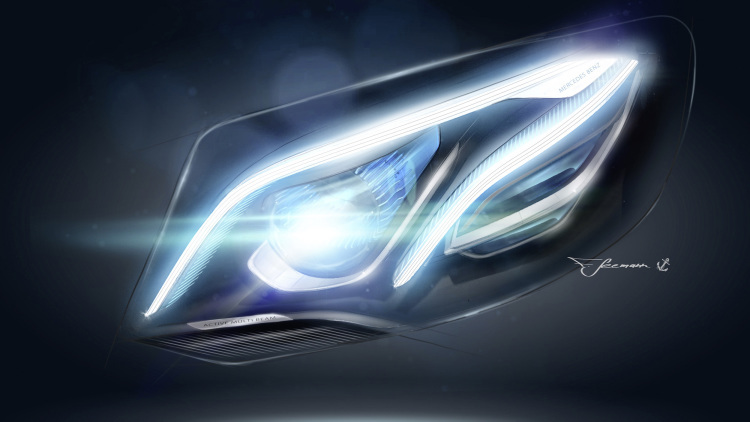 First of all, the E class is fitted with new Multibeam headlights that come with 84 independant LED bulbs. Road safety comes first, and Mercedes has been working quite hard on assuring the security of its cars, therefore, the new headlights turn towards the direction you’re headed to. Still, the car still has that impression of having the “4 eyes” a distinctive feature of the E class. Not only that, but the car new aggressive look is assured by a new revised grille, that comes with the tri-star in the middle. The new car lines improve the aerodynamics performance, the result is a staggering drag coefficient of 0.23. This improves the car road performance, and reduces overall fuel consumption. 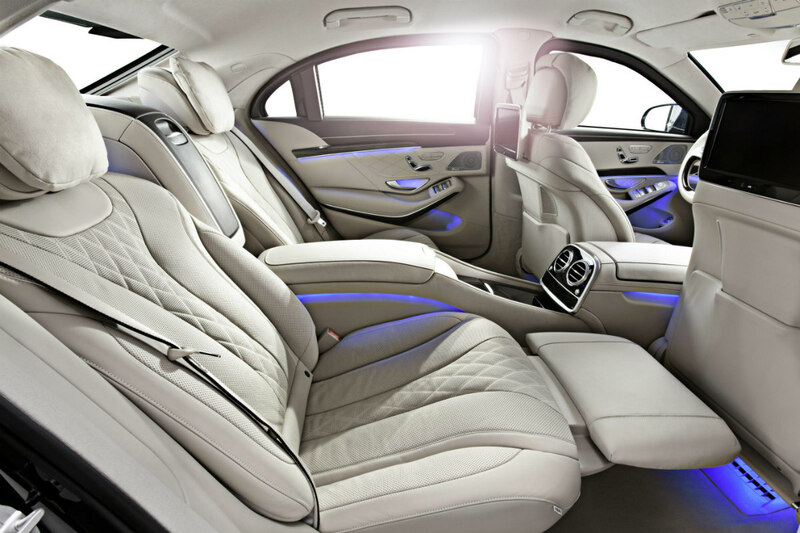 The most fascinating thing about the new E Class is the interior. Everyone talks about it. And it deserves a 6 star rating. It embodies Mercedes Benz philosophy, “The Best Or Nothing”. This is, so far, the best, most sophisticated interior I witnessed, and the new features it comes with, makes the E Class, once again, the best sedan to have. For everyone who got inside the car, the first noticeable thing is that, it looks like the S Class from the inside, it has the same guts, but a spirit of its own. The feature most expected is the the Remote Parking Pilot function, which allows you to park in or out the car using only your smartphone, so just a spin on a circle on your phone screen will have you guide your car, in or out of the parking spot. Not only that, but also, the E Class is fitted with a smarter steering wheel, with new touch control, which makes it feel like a smartphone. 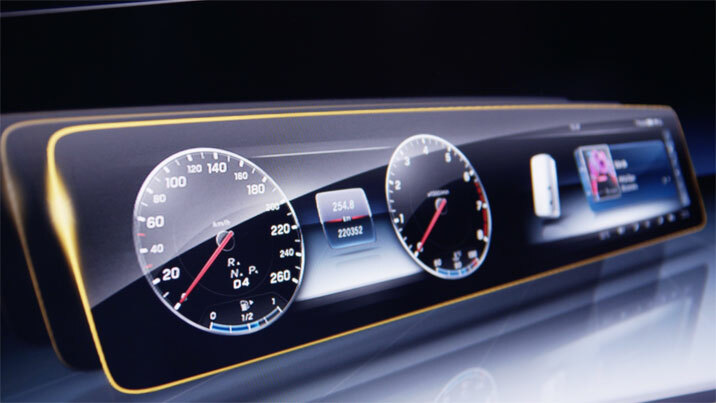 The E Class did not have just the same interior as the S Class but also, some of the technological features, such as the lane keeping assist, which maintains the car in the same driving line and the same distance from other cars at speeds close to 120 mph (200 kph). It comes with assisted steering, that notifies the driver when a danger on the road is coming, that detects its pulse, and vibrates in case, he sleeps. You can say that the E Class is not the best car to have a crash in, it just won’t let you, it has enough assistance systems, radars, sensors to make it one of the smartest and the most secure cars on the planet. 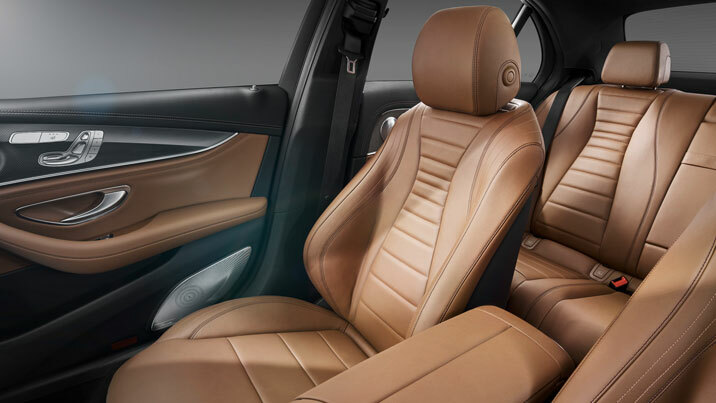 For the driver’s well-being, the seats are fitted with a massage option, a better surround sound system, one of the best actually, it is the new second-generation Burmester 3D surround system. It comes with 23 speakers and two amplifiers for a total of 1540 watts. The car has an impressive sound isolation system, when inside you do not have to worry about the outside world’s noise. Screens replaced all the buttons, so it seems like the car is a huge smartphone. There is no price put on such luxury. The car is amazing, it is expected to rock the automotive world. 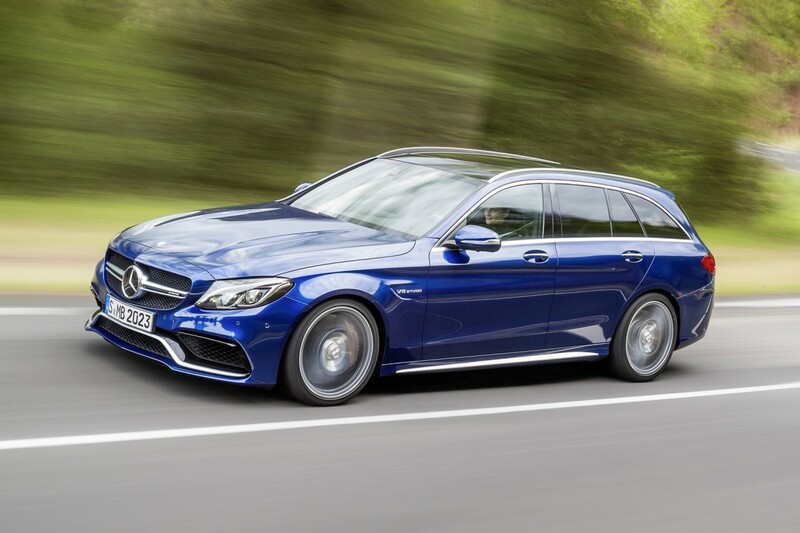 Once again, Mercedes Benz has taken a new step forward compared to each competitors. Dr Mansory was known for creating powerful crazy monsters, some of the cars that were tuned by the Mansory program are the Ferrari F12, Mercedes Benz G class, the Mercedes McLaren SLR and the list goes on. Tunings involve body works, works on engines, exhaust systems… but what if the monster is the finest car in the world, one of the most luxurious cars on earth? Mansory has no problem working with that, and the result is impressive. 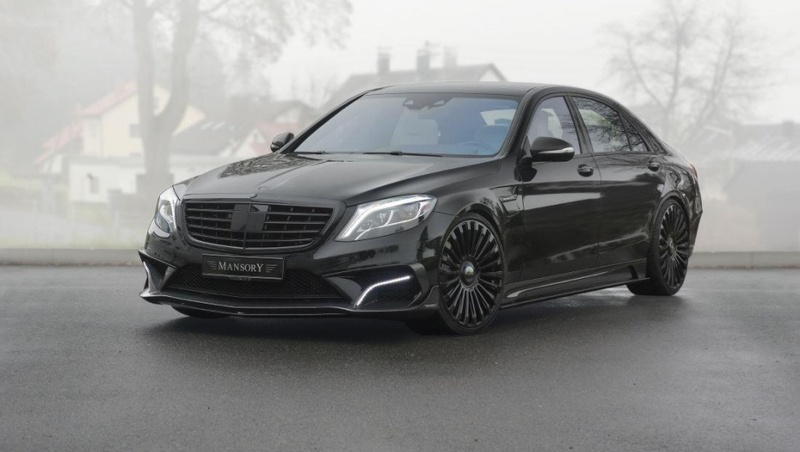 The last monster to see the light ever in the Mansory garage, is the S class, with a lot of power, how much you may wonder, 1000 bhp version, and a reasonable 800 bhp version. Note that the base S63 model has a 5.5L V8 that produces just 575 bhp. 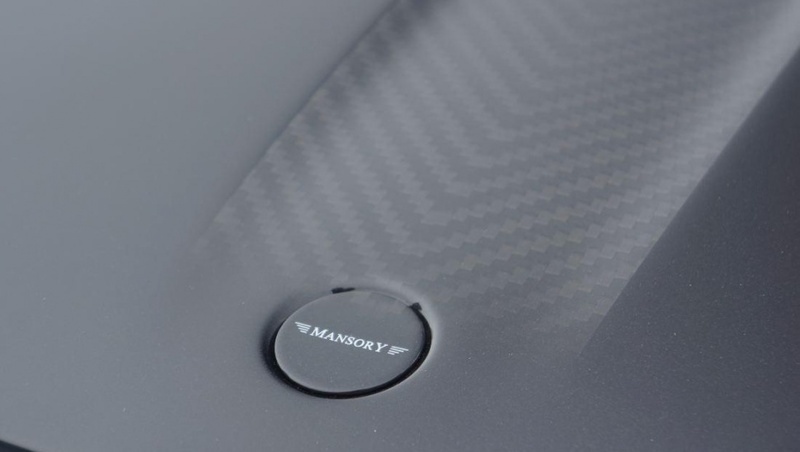 However, for people at Mansory the power output did not seem like enough. The 1000 bhp version has been fitted with the M1000 kit, a 5.9L V8 engine, that produces 1400 Nm in torque. The kit includes new changes and mods the most of the engine parts. The car has now a new crankshaft, a new turbo, new suction and compression systems.The car goes from stop to 100 kph in just 2.6 seconds, which is faster than The Mercedes SLR, The Chevrolet corvette C6, the Gallardo LP-560, and even the Mercedes SLS AMG and The AMG GT. Top speed is sadly limited to 300 kph. The M800 kit rockets the car in 3.6 seconds, 0.4 seconds faster than the standard model. Both the cars were fitted with a new aerodynamic program, which includes new front wider spoiler, roof and rear lips, side skirts, rear diffuser apron, bonnet, side mirror housing and LED daytime. All the aerodynamic pieces were made from carbon-fiber. When Mercedes did not register its C63 AMG and AMG S in the official press conference of the Paris Motor Show, everyone thought that the German giant will present them in any other occasion, but Mercedes wanted its fan and the press to wait more, for publicity purpose, nothing more. 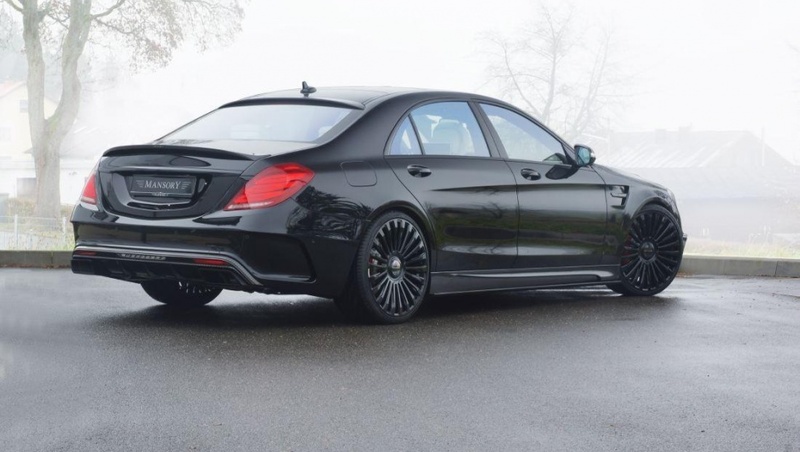 Yesterday (October 2nd 2014) the C63 was revealed in four models : 2 breaks and 2 sedan cars. Benz disappearing from the name of the car, once more, because now Mercedes associates AMG to all its sport models. The C class was revealed in the spring of 2014, and we had to wait until now to get the AMG versions. 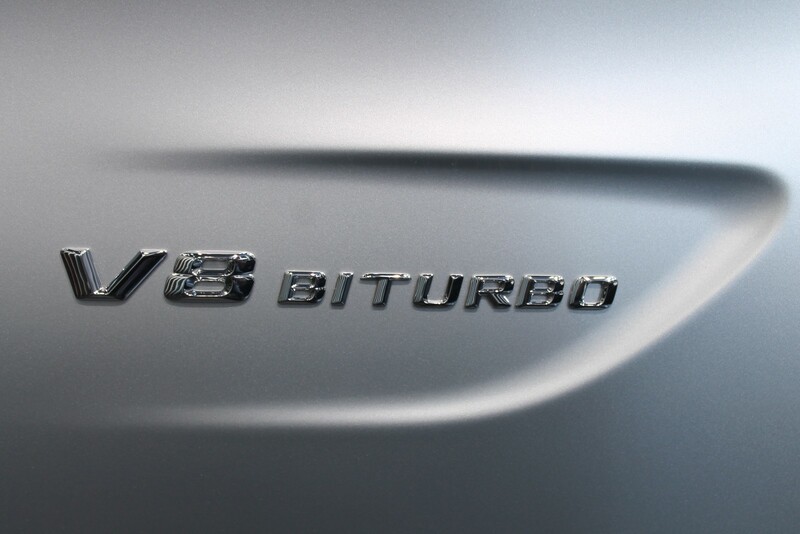 Usually, it is only one model, with a big 6.3L engine, but with the introduction of the new 4.0 V8 biturbo, Mercedes will have two variants, same as the Mercedes AMG GT. So you have it then, the C63 AMG will be powered by the same engine as the AMG GT, that produces 467 bhp and 650 Nm for the AMG version and 510 bhp and 700 Nm for AMG S version, same for the breaks. 0 to 100 km/h will be achieved in 4.1 seconds, for both the sedan and the break in the AMG version, however for the AMG S configuration, it will be 4 seconds flat for the sedan and 4.2 for the break. Both engines will have and AMG MCT-7 paddle-shifted multidisk-clutch gearbox hooked to them. To give better noises, there will be three active modes for the quad tailpipe exhausts. The top speed is limited to 250 km/h, you have to throw out all the electronics from the car to make your engine go further. 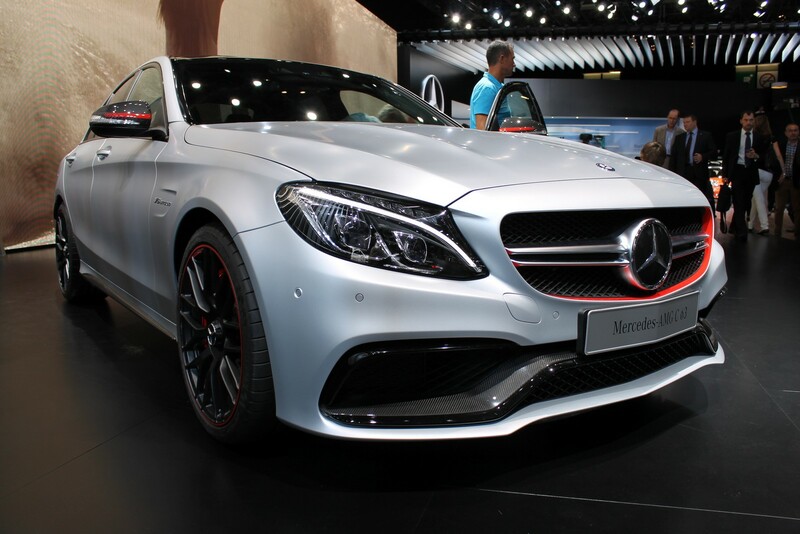 The AMG can be recognized by the sporty red lines on the grille and around the wheels. the car has the AMG front dumper fitted to it, the hood is reworked for a better aerodynamic result, and in the rear, there is a carbon-fiber small spoiler over the trunk and a rear diffuser separating the quad tailpipe. The interior is all about sport, aggressive, yet elegant. The steering wheel is covered with Alcantara, the seats are in black leather. Red and black ambiance dominates the interior, for a serious sporty look. The C63 AMG is equipped with a new suspension, with 3 different setting modes, to offer, a comfortable, or aggressive driving. The C class was the best-seller of the Mercedes Benz, with 40000 units for the old C class, Mercedes expects this one to do the same. There was no price revealed, yet. Future Mercedes owners will be happy, because of the decrease in CO2 emission 192 g/km compared to 280 g/km which means less taxation. The car will be available starting February 2014, 2 months later for the break version. One year after revealing the S class, Mercedes Benz has impressed everyone by its luxury and intelligent driving-assist systems, and with the S63 and the S65 AMG, it deserved the title of best car in the world. But, the people of Mercedes said it is not enough, they are working now on a S600 Pullman long, after revealing the S600, and officially we will have the pleasure of meeting the S600 guard. Being no stranger to producing protected cars, with already made models of the S, M, G and E Class, Mercedes Benz went to perfection with this one, the S600 guard. 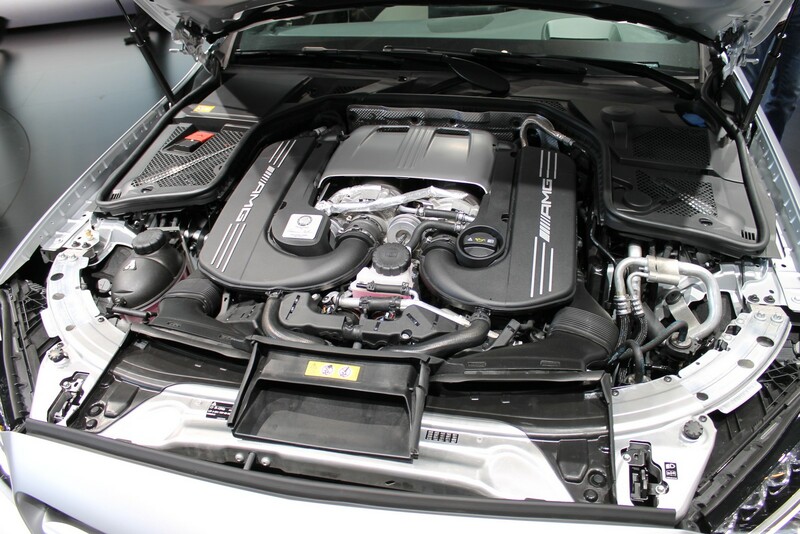 Under the hood, it has the Same 6.0 L V12 powering the regular S600, and delivering a power of no more than 530 Bhp, and a torque of 830 N.m (612 pound-ft ), with a speed limited to 210 kph due to heavy installment. 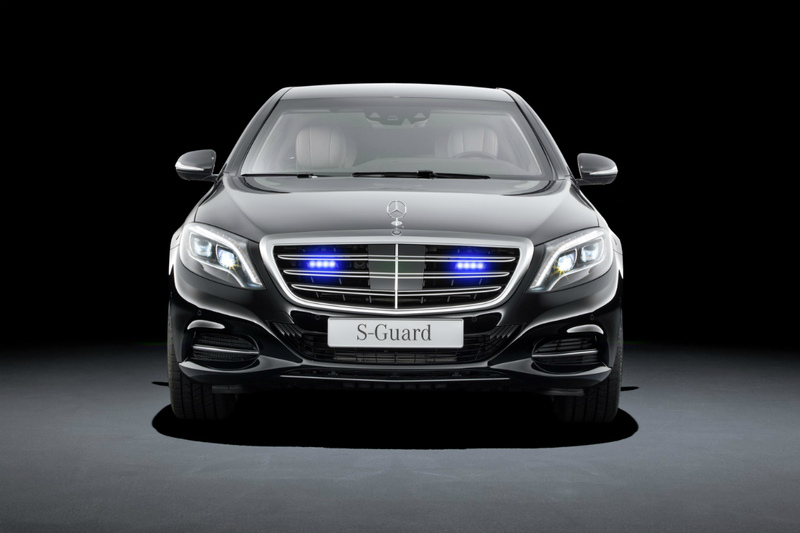 The S600 Guard weighs in total 3735 kg ( 8217 lbs). The reinforcements include but they are not limited to 100 kg more to each door, the windshield weighs 140 kg. The windows are 40 to 55 mm thick, and weigh each 40 kg, black colored. The fuel tank is highly protected. The car can withstand simple bullets AK 47 bullets, hand grenades and even explosions underneath it, like a 6 kg mines. The process goes like follows, the car is completely disassembled, each panel is reinforced of both steel and aramid plaques. Then the car is fitted with laminated windows, recovered with Polycarbonate. to a grand total of 400 kg of B4 Armoring in the high protection level , and 1400 kg of a B6/B7 armoring in the highest level protection. The car is awarded with highest level in the matter of protection : the VR9. The chassis, suspension, brakes, ESP, Pre-safe system all have been reviewed. Airmatic air suspension have been adapted to carry on the weight of the car. And with new technology of Michelin, the S600 Guard can do 19 miles on flat wheels. 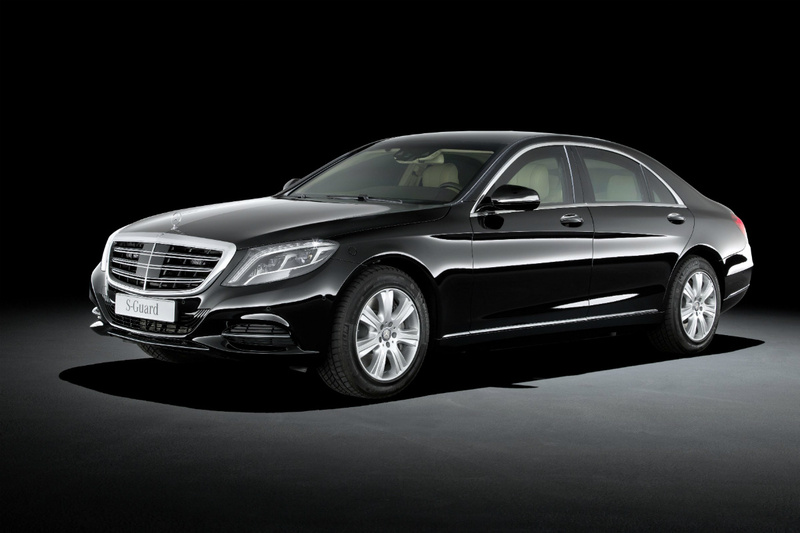 Mercedes did not announce a price for the S600 Guard, but all we know is, that it is custom made for each client.